Cryo Hops® LupuLN2™ hop powder and pellets are produced from whole leaf hops using YCH HOPS’ proprietary cryogenic separation process that preserves all components of each fraction. LupuLN2 is purified lupulin powder containing most of the resin compounds and aromatic oils derived directly from whole hop flowers. It is ideal for use in the whirlpool or fermenter for imparting intense hop flavor and aroma with minimal vegetal flavor and improved yield. 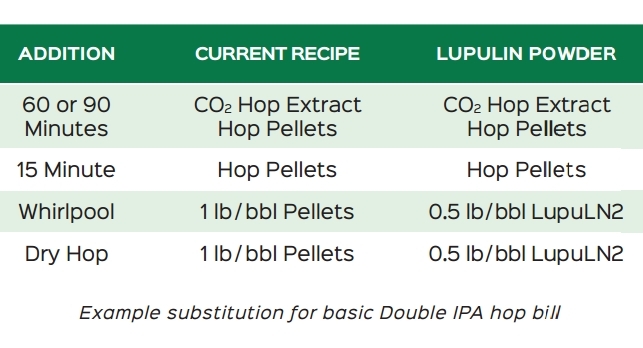 Used in combination with Resinate® CO2 extract, LupuLN2 can add hop aroma and flavor to the end of boil or in dry hopping for a twofold approach to achieving superior brewery efficiency without sacrificing flavor. Depending on how much pellet or whole leaf is replaced by either of these products, breweries may see significant improvements in beer yield which contribute to both the bottom line and sustainability mission of YCH and many of our customers. LupuLN2 may be used anywhere pellet hops can be used and are best used for late kettle and dry hop additions. As a starting point for recipe formulation or modification dose rate is estimated at 50% of pellets by weight. 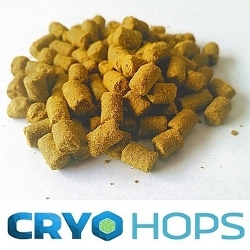 It is best used in beers defined by their hop flavor and aroma with hop loads of at least 1 lb/ bbl in late kettle or dry hop additions where a larger yield increase will occur from substituting out pellets or whole leaf. Storage conditions: Store in dry and cold place - not higher than 5°C.